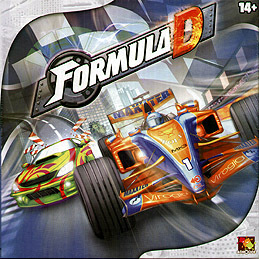 The action-packed game for Formula 1 and Road Races! "Formula D" transports you into the turbulent world of Formula 1: don't lose control of the engine in the last bottleneck, master the chicane, stick to your opponent's back wheels, take advantage of the slipstream and then coolly overtake him... A Formula 1 pilot has to be willing to take risks and be able to plan ahead - at least if you want to get to the very top of the winners' podium. Formula D also means the suspense of illegal racing on the streets of the big cities. Anything goes: customized cars, nitro injection, skidding in roundabouts, unfair tricks... The game principles always stay the same, but different cars, rules and circuits come into play. This new edition of Formula D contains material which has not yet been published, including painted cars, dashboards, driver profiles, circuits... And simple playing instructions are enclosed, allowing you to start play immediately. Off you go! Some people may be put off by the 'roll and move' mechanic of this game, but it is to me an excellent one. You have a series of dice to represent 1st to 6th gear and you must push your luck to go as fast as possible, whilst still being able to end your move a number of times in the corners. If you fail this, you take damage. It's very simple and plays nice and quickly, just like a racing game should, but don't be fooled, this game is not just random chance! You must slipstream, overtake and decide whether to slow down or take damage to your car's core systems (brakes, gearbox etc.) A lightweight, but still tactical game, presented in a colourful and clear way with enough optional rules and alternate game modes to keep you racing for a good amount of time. Best played with the full amount of people, but also good with half the number running teams of two cars each. Keep an eye out for the extra tracks being released! This new addition from Asmodee of the classic Formula De is pretty much unchanged gamewise from the previous addition. 3. The New Gearbox/Wear Point recorder is brilliant. 4. Cars are small, but no smaller than the diecast cars for the original and still useble with the circuit boards. 5. Graphics are more serious - although the street race side has an anime feel. I have both and will definitely be using the new gearboxes instead of the pencil and paper recording of the original.